The Daedalus Sentence is one of those games that you’ll have an opinion on before you ever crack the box. The massive 16.5” x 16.5” box is the only box this size I’ve seen on the market. The healthy $150 MSRP is another eye popping number. For most gamers, these will be enough to make Daedalus Sentence a pass out of the gate. And that’s fine. This is very much a niche within a niche within a niche type of product. 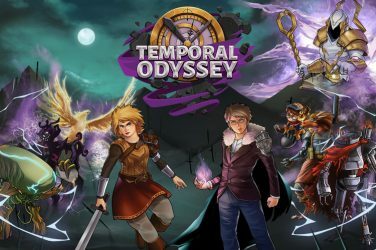 A unique production that is supposed to look and feel different from most other cooperative games on the market. Here’s the thing – if it was unique and if the product honestly felt like it earned that price point, the review you’re about to read would be very different. Is The Daedalus Sentence a good game? Yeah, for the most part. But is it worth all this production and cost? That’s a harder question to answer. For as much as comes in this box, it’s actually fairly straightforward to play. 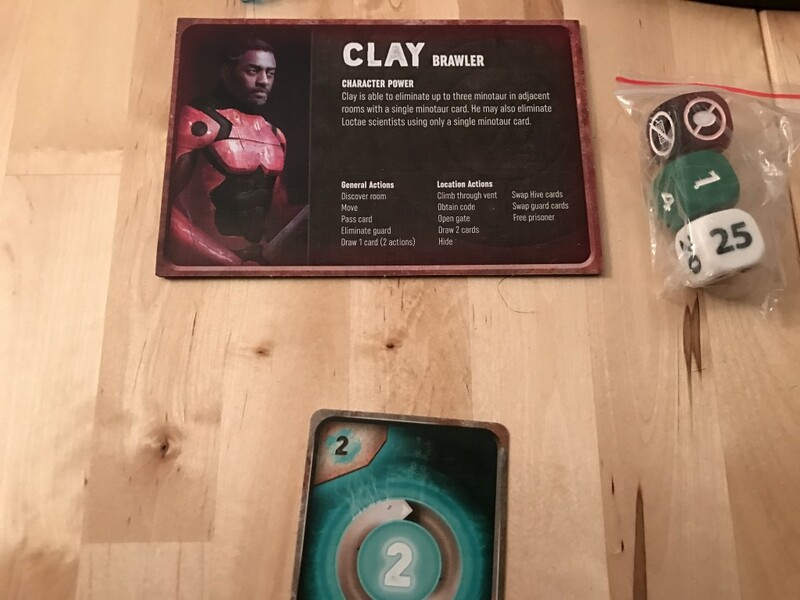 Between 1-4 players take one of the five available characters and their matching board. The goal is to get all of these figures out of a labyrinth and to the exit. While trying to escape, of course, there will be Minotaurs and Loctae Scientists. 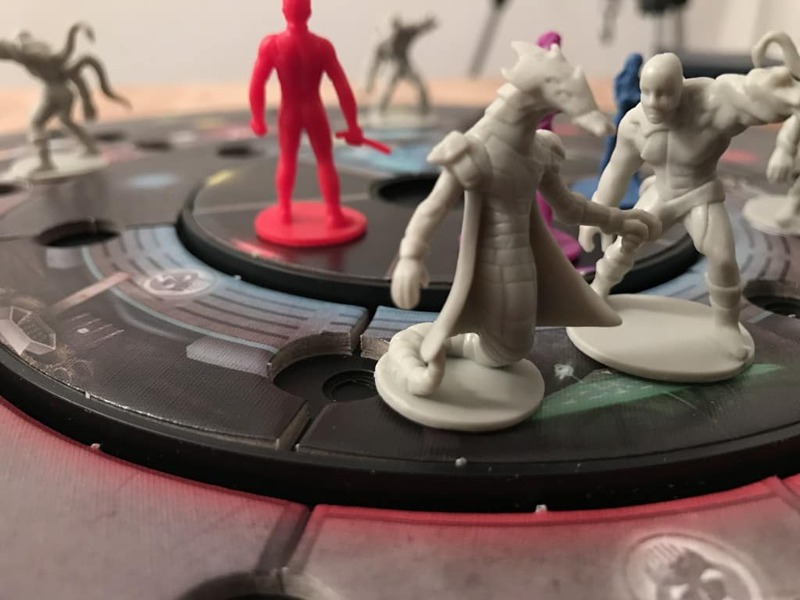 Thematically, the game sets up an interesting world – about 65 years in the future after Earth has been defeated by the Loctae race who has either killed or enslaved the vast majority of humanity. You are one of several humans at The Hive, a lab on Ganymede where experiments are performed on humans. Your job is to escape, which requires careful manipulation of the game board, enemies, and resources in your hand. 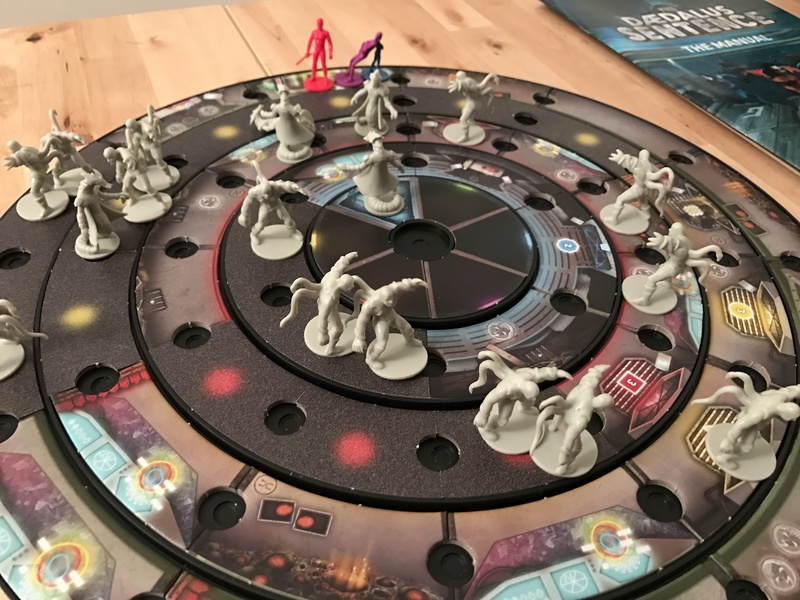 It’s a great concept, made all that much more interesting by the addition of a circular, moving board. At the start of the game, there are four rings – color coded blue, red, yellow and green – all with face down tiles. You must explore and flip these tiles face up as you hunt for gates. Gates allow you to go from one ring to another with the required code (represented by color/number coded cards in your hand), all with the goal of finding the final gate on the outside ring to escape. Each round, however, those rings will move and disrupt your planning as enemies spawn, rooms you need to access spin away from you, or walls close you off from the nearest exit. If Minotaurs or Loctae reach any of your people, they are captured and returned to their cell, and if they get captured a second time (or if all of your people are captured at once), it’s game over. Each of these characters has a special ability which can come in very handy as you proceed through each of these levels. You’ll have a hand of cards you can use to interact with certain rooms and change the cards on the Theseus board (which determines how rings will move and where enemies will spawn or move). You can also get rid of enemies with the right cards and the right placement, so there is plenty of mitigation, but for all intents and purposes, you’ll mostly be running. 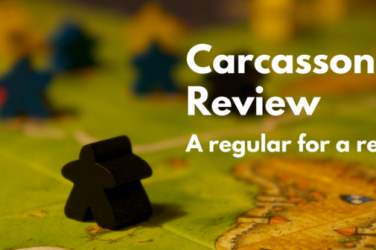 It’s a clever system and it feels unique and fun for the first 30-45 minutes of play. 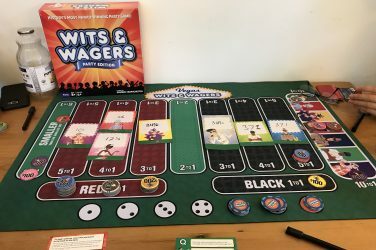 Despite the complicated wording of the rulebook and how it parses the several different types of programming you might run into, the game is fairly simple – in line with most mid-weight co-op games. The Daedalus Sentence is a decent game. 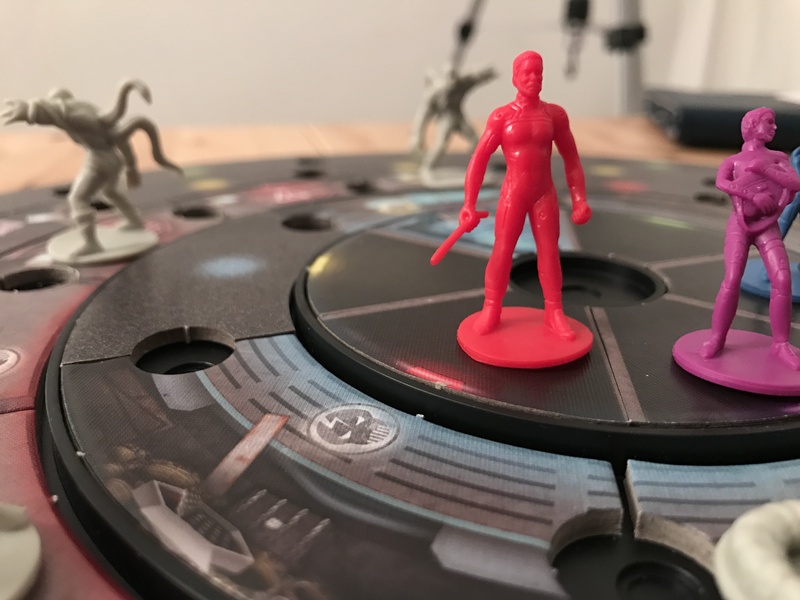 For a co-op, it is fairly well balanced with each action you take being potentially dangerous, requiring that familiar risk-reward discussion with the rest of the table. Each player’s special power makes it interesting to discuss who might go in and risk themselves to flip a tile or move to the next gate as well. Can we afford to lose the ability to move through vents unimpeded? What about our Minotaur killer? Who should take one for the team? And now who will go back and set them free? It’s that balance that really gives the game its edge and the combination of dozens of Minotaur miniatures and the much meaner Scientists converging on your location is fun to try and puzzle through. Since you can see in advance who is coming and where they are going, you can spend your turns balancing things out and making strategic moves instead of trying to run too far too fast, even if it is tempting to just get away. The board is of course the centerpiece of the game. The large plastic base holds dozens of cardboard tiles with holes between them. You stick your finger in the hole and push or pull to move the board in either direction depending on the programming. This works well, and despite some online reports of tiles popping out during the turns, I’ve had no issues. The key is to turn slowly and make sure miniatures are standing squarely on the board. It adds a distinct puzzle element with a bit of push your luck as to where you’ll explore and how far you’ll push out before going through the next gate. I like this element quite a bit. I honestly feel this is a very decent co-operative game with a unique system of programming, hand management and escape. There are also several modules to increase difficulty and make it harder once you master the base – all very much appreciated in a game of this size. But despite those positives, there are some major issues here that make it tough to recommend. To start, the game is really not that complicated. 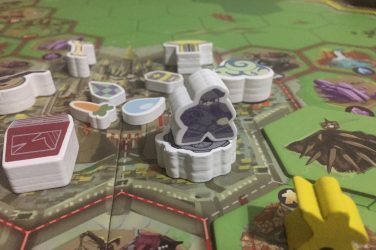 There are other “escape the guards and reveal tiles” games at much lower price points – maybe not as intricate, but similar in a lot of ways. At the same time, the rotating board, while clever, is a behemoth. It takes a lot of space, time to setup, time to manage, and a closet in which to store it. It’s the kind of game that a small publisher on a short print run pays a fortune to produce, and the MSRP reflects that. There is not $150 worth of game in this box – which is a problem. 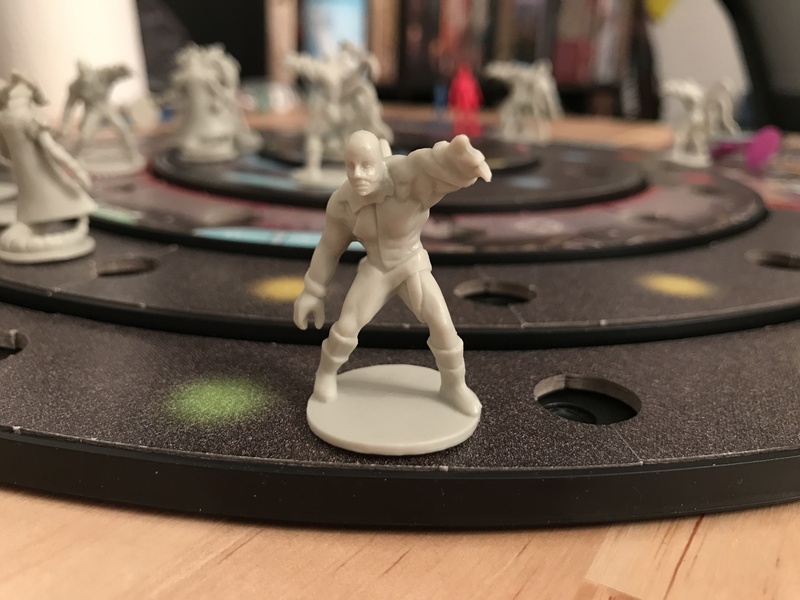 From low quality plastic in the miniatures that means washed out features and bent miniatures, to the uneven bases, the component quality here varies between poor and decent (in the case of the linen finish cards and tiles). Nonetheless, still not in line with what I’d expect and want to see in a game that costs more than Space Hulk. On the gameplay side, there are issues as well. 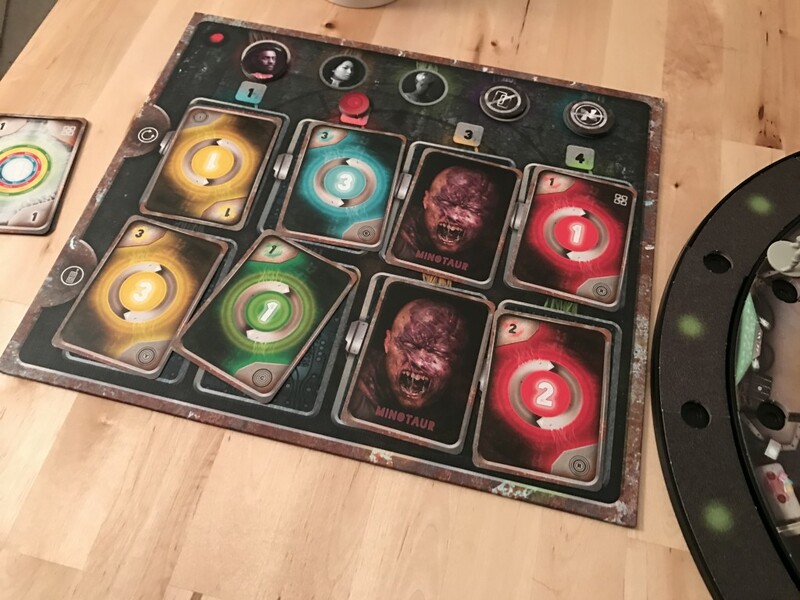 Because the rounds get longer as you move toward the outside of the board with more Theseus Board actions at each alert level, games can run long. Several games played ran upwards of two hours, about 45 minutes longer than felt appropriate for the mechanics. We won, but instead of it feeling like a triumph, it felt like the end of a long slog. To be fair, the game comes with several difficulty enhancers that will streamline the game to a good degree, removing the AP triggers, and in one case even adding a timer to the game so you can’t try to unpuzzle every action rounds in advance. 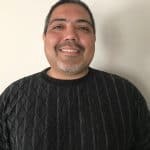 But, this level of game customization only becomes viable after a handful of plays, and the rulebook, while comprehensive, is at times jumbled and hard to follow. Even with these difficulty enhancers, layers of complexity are essentially more of the same stuff. 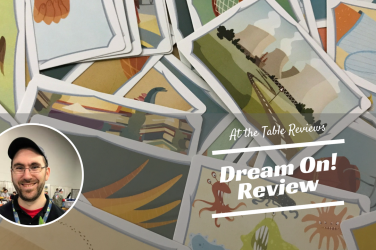 What was exciting and interesting in round one and two becomes at times exhausting later in the game, leading to AP in the end in many plays. The Daedalus Sentence is not a bad game. I like the mechanics. I like the twisting board. I like the feeling of running for your life and the interesting decisions this leads you to make. And the idea of enhancers that allow you to tweak the game to match the difficulty level you want for your group is great. But despite these things, I cannot recommend this game. The game doesn’t offer the sort of depth needed to warrant the size, cost, or investment of time and space needed to play it. It’s a fine game, but there are several others on my shelves I would rather bring out before this one. 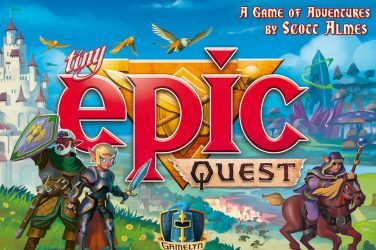 For those who did not back it on Kickstarter for a relatively more reasonable (but still fairly high) price, this game just isn’t enough for what you’re paying. On price and production alone, it’s a dodge. Gameplay doesn’t manage to salvage it from there. 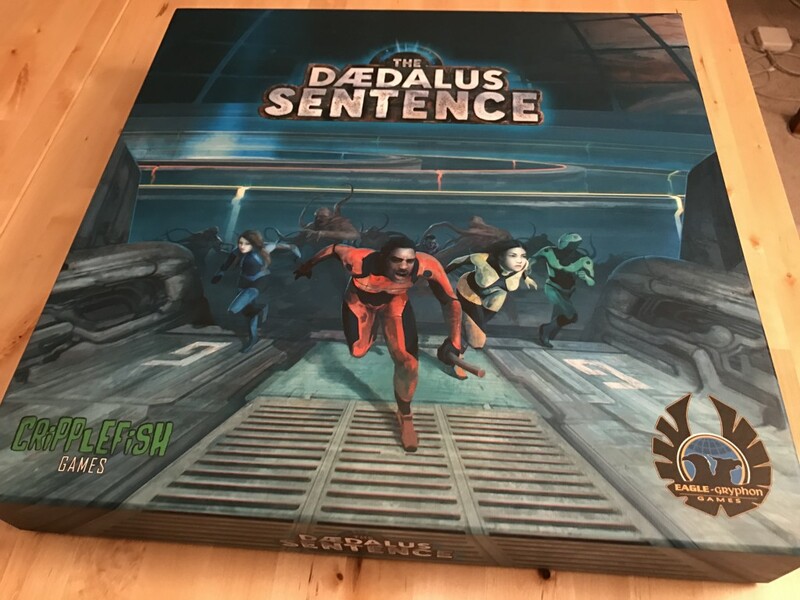 The Daedalus Sentence is an interesting game with some unique mechanics, but it lacks enough depth, variability, or quality components to warrant the incredibly high cost and space requirements. There are better games with similar mechanics at lower prices.